Filing tax returns poses as a very vital step towards maintaining the country’s economy and one’s business. That’s why, with new tax regime rolled out in India comes the major responsibility of GST return filing; which is going to be a monthly deal from September 2017. Previously, we researched and analyzed the impact of GST on the Indian hospitality industry. Adhering to the slab-wise GST structure for the industry, the hoteliers and restaurateurs will need to be discrete and accurate with the sales and purchase data and clear up the disputes and amendments. Ergo, following our impact analysis, we’ve come up with the action steps you as a hotelier (or a restaurateur) need to take for GST return filing for your hotel (or a restaurant). What do hotels and restaurants need to know? Mandatory for all GST registrants, GSTR-3B is a simple and summarized form introduced by the government to let you file GST returns for the months of July and August*. You’ll need to file GSTR1, GSTR2 and GSTR3 for both these months later in September. GSTR-3B won’t be applicable from September onward, and you’ll have to file complete GSTR1, GSTR2 and GSTR3 forms for your tax returns. You won’t need to provide detailed invoice information for GSTR-3B, and rather only the total amount pertaining to each field in the required format of the data. Filing GSTR-3B is mandatory for hotels and restaurants who fall under the GST regime. If you’ve had no transactions at your property in these two months, you need to file a nil GSTR-3B form. Subject to the announcements made by the government to not accept GSTR1, GSTR2 and GSTR3 in future for any reasons whatsoever, it’ll be mandatory for you to file GSTR-3B for that month. What is GSTR1, GSTR2 and GSTR3? Under the GST law, a normal taxpayer will be required to furnish three returns monthly and one annual return. The three returns monthly are said to be as: GSTR1, GSTR2 and GSTR3. All three of these returns are mandatory for all GST registrants. You’ll need to file NIL returns if you’ve had no transactions in that month. In addition, Input Tax Credit will have its own mechanism for these returns, such that, CGST credit cannot be set off against SGST liability and vice versa. GSTR1 will include the outward supplies you made to other registered businesses (B2B) at invoice-level and that to the unregistered businesses at rate-wise level. The GSTR1 form contains 13 tables in all, according to which you’ll need to submit the sales data of your property of that month. Considering your hotel (and/or restaurant, as the case maybe) type and the sale you made, only some tables will be applicable for you and not all. Using your GSTR1, the government will populate the GSTR 2A of the recipient (or guest) who purchased from you and your GSTR3. Once GSTR 2A is populated, you’ll be able to accept the sales; which will in turn lead your recipient to file his GSTR 2 in next 5 days. That’s why, you are given 5 days time to amend your GSTR1; post which you won’t be able to make any revisions in the return. The GSTR2 will contain details of the inward supplies you purchased in the month. The supplier you purchased from will be able to make the amendments to his GSTR 1A after you’ve uploaded your GSTR2 form. In this form, you’ll need to mention whether you’re eligible for Input Tax Credit or not. If yes, you will have to fill the amount of eligible Input Tax Credit as mentioned in the invoice. Most of the details in the GSTR3 will be auto-populated from GSTR1 and GSTR2. Only some information, you’ll have to verify and add. If you have not filed your GSTR1 and GSTR2, you won’t be allowed to file your GSTR3. The process goes like, once your GSTR3 gets generated, you’ll have to pay off the tax credit and then file the GSTR3. What’s the timeline for GST return filing? How can hotels and restaurants file their GST returns? Filing GST returns under the newly introduced GST regime is extremely pivotal as the delay or mismatch or absence of filing the returns will influence the credibility of your business, your compliance rating and prompt returns. There are primarily 4 ways in which you can file your GST returns. Nonetheless, you’ll have to solve the disputes yourself regardless of the method you choose to file your GST returns. 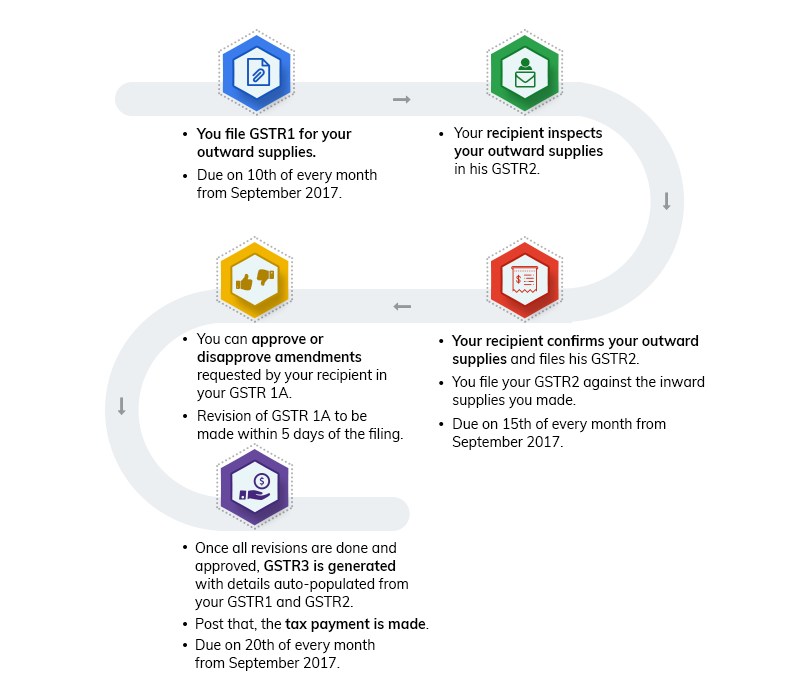 Directly via the Government Portal: The most simple and straightforward method to file your GST returns. Calculate, form and submit your returns manually on the government portal, make amendments and finalize the tax payable. Major Hassle: Since you need to gather and submit all the details manually, it can give way to errors and inaccuracy. Through a Certified GST Practitioner: Considering the current scenario, most of the hoteliers and restaurateurs rely on their GST practitioner to submit their GST returns. Major Hassles: Coordination with GST practitioner, troubles of gathering the data and eventually having to make amendments and resolve disputes manually under the guidance of the practitioner. Through a GSP: Either you can directly contact any GSP from the GSTN approved 34 GSPs across the country, or choose a hospitality solutions provider who has a ready integration with GSP with their hotel PMS and restaurant POS systems. Major Advantage: You’ll be able to make amendments in the GSP software directly from the interface itself, thus reducing your hassles of downloading the file and manually solving the disputes. Besides, an accounting software may or may not be suitable for hotels and restaurants, but any GSP will be ideal for the industry. Note: We have ready integration with JioGST GSP, such that, you’ll be able to submit your GSTR1 data directly from our systems automatically to the GST software. Cost of getting JioGST GSP will be INR 2000/month with JioFi device and unlimited 4G data connection. Through Tally Accounting Software: Tally is a certified GSP as well a GST-ready accounting software, which will provide you with all of your purchase data accurately in the required format. Our GST-compliant hotel and restaurant management systems have a ready integration with Tally. On that account, if you choose this option for filing your tax returns; you’ll have GSTR1 data ready from our software and GSTR2 data ready from Tally. In addition, Tally being a GSP; you will be able to directly submit your tax returns to the government through Tally’s GST software. Major Advantage: Since Tally is a GSP and a GST-ready accounting software, you’ll be cutting down a step here to get GSTR2 data and submit your returns through a single means. Why having a hotel or restaurant software is recommended? In either of the above cases, you’ll have to collect and submit your sales (outward supplies) and purchase (inward supplies) data from your accountant (if you have). Consequently, while gathering the sales and purchase details; your hotel or a restaurant will need help from both – the practitioner/accountant and the PMS or POS software you use. Automated operations, ready data, and several other benefits of a GST-ready hotel and restaurant software can help you in filing GST returns. Available Data: GST-compliant PMS or restaurant POS systems will provide you with ready GSTR1 data right from the system, thereby in the long run, easing your efforts of filing GSTR1 and even in filing annual returns. Cost-effective: Whether you choose to go via the government portal directly, or hire a practitioner, or any other way, getting a hotel or restaurant software and an accounting software will prove to be considerably cost-effective and time and effort-saving. *The prices shown here may tend to change as per your requirements. Interface with GSP: The all set interface of the software with a GSP will help you submit your returns automatically from your hotel and restaurant software through the GSP software and to the government. Error-free: Without a software, the returns that you submit may be prone to manual errors and calculation glitches. But with the PMS or POS software’s automated operations, you have minimal worries about accuracy. Manual Amendments: In case of any amendments, you’ll have to manually download the file from the government portal, make the necessary changes and upload the JSON file (mediator file) again, thence making it a tedious process. Suffice to say that, purchasing a software for your hotel or restaurant will be highly beneficial for your business, and help you in your GST return filing; regardless of the option you choose from above. We have GST-compliant cloud PMS, on-premise PMS and on-premise restaurant POS system to give you everything you may need in managing your taxes and operations, in addition to offering customized GST reports and GST-compliant invoices. Handling and filing multiple returns may take a toll on your business sooner or later. Solidify and streamline your operations in this prevalent GST regime with GST-ready hotel software and restaurant management system. Note: All the information given on this page is subject to the notifications passed by the GSTN and Government of India.